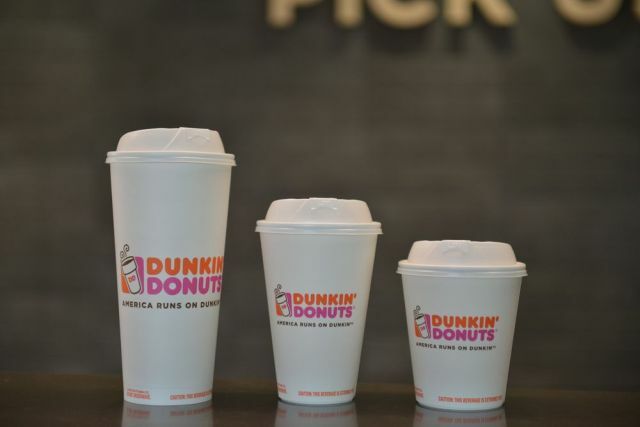 Dunkin' Donuts plans to stop offering polystyrene foam cups at all locations globally by 2020. Here in the US, Dunkin' will replace the foam cup with a new double-walled paper cup. In the near term, the new cup is already in use at their "store of the future" concept location and is slated to roll out at all locations in New York City and California this spring. The double-walled pepper cup is made with Sustainable Forestry Initiative Standard-certified paperboard. It comes in the same sizes as the current foam hot beverage cup (small, medium, large, and extra-large) and will have the same heat retention and enough insulation to be handled without a sleeve. The donut and coffee chain already uses paper cups in the majority of international markets and is working on getting rid of foam cups at the rest of their locations. While paper cups are more environmentally friendly than foam ones, they're not easily recycled due to a thin plastic inner lining that makes the cups waterproof but is hard to separate.